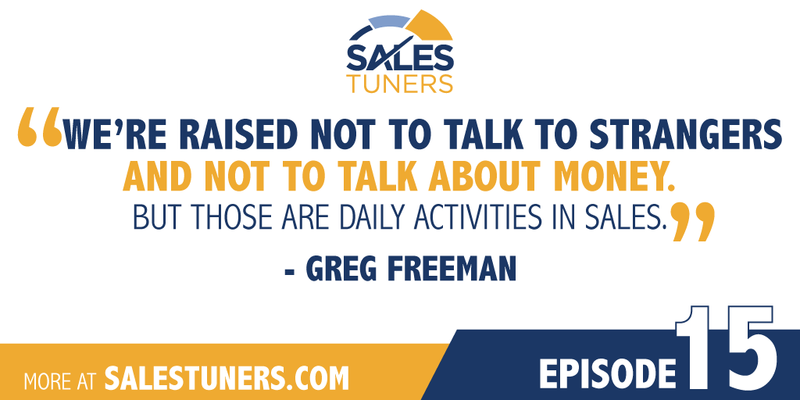 This week, I’m joined by Greg Freeman, a Partner at Westpoint Financial Group. While ascending the ranks at the firm, Greg was named WestPoint Financial Group’s “Rookie of the Year” and a few years later, “Agent of the Year.” Not bad for a guy who didn’t realize out of school that being a financial advisor meant he’d actually be a salesman. Like a lot of us, Greg was raised to never talk about money and never talk to strangers. Unfortunately, that just happens to be the daily job description of a salesperson. While struggling out of the gate, Greg recounted his desire to succeed in the financial business and how he worked to gain “equal business stature” at 23 years old, so he could learn how to ask people more successful than himself for money. Greg said consistency was the main driver in his success. He works hard to have consistent behavior every day while also maintaining a steady demeanor. All you have control over is the input that you give every day, and while it won’t always go your way, the ability to quickly shrug off any setbacks or failures, gets you right back in the game. It’s Not Your Money: This remains a challenge for most people in sales, but you have to realize, the amount of money you’re asking a person for has no correlation to your own wallet or your perception of “a lot of money” is. Just because you couldn’t afford to buy something, or just because you’ve never done what you’re asking the buyer to do, doesn’t mean they can’t or shouldn’t. Overcome the Default Objection: How many times have you walked into a store with a specific intention to buy something and when the store clerk asked if they could help you with anything your default response was, “no thank, I’m just looking.” Pretty much every time, right? Buyers of your product are doing the same thing by saying “they’re good” or “they already have someone.” What are follow up questions you can ask to break through that initial objection in your world. Quit Thinking, Start Doing: It was General George Patton that said “a good plan violently executed now is better than a perfect plan executed at some indefinite time in the future.” to break that down, simply GET OUT of your own way. Pick up the phone, send the email, just start doing something.